SEEING THE INVISIBLE GOD | Connecting with You! The implication, obviously, is that because God cannot be seen, He therefore does not exist! Apart from being patently false, the comment reflects not only an arrogance but also an ignorance of considered reflection. For example, we can’t see radio waves but we still turn on our televisions and expect to watch a programme. We can’t see wireless signals but we nevertheless use them to access information on our computers and to make a call on our mobile phones or send an SMS. We can’t see gravity but we know that if we drop an egg it will splatter on the floor. We can’t see oxygen, but without it we would quickly die. However that statement is inherently contradictory as it cannot be tangibly proven! Nor does it depend on scientific authentication. Nevertheless, God has chosen to reveal his presence and his character to us. The evidence of God’s existence is seen in creation – ‘By taking a long and thoughtful look at what God has created, people have always been able to see what their eyes as such can’t see: eternal power, for instance, and the mystery of his divine being. So nobody has a good excuse’ (Romans 1:20 Message). The real message of Christmas! This is the glorious message of Christmas – the transcendent God became incarnate in the person of Jesus Christ. Dr Jim McClure, author of several books and Bible study series, welcomes questions from Christians seeking enlightenment on biblical perspectives. 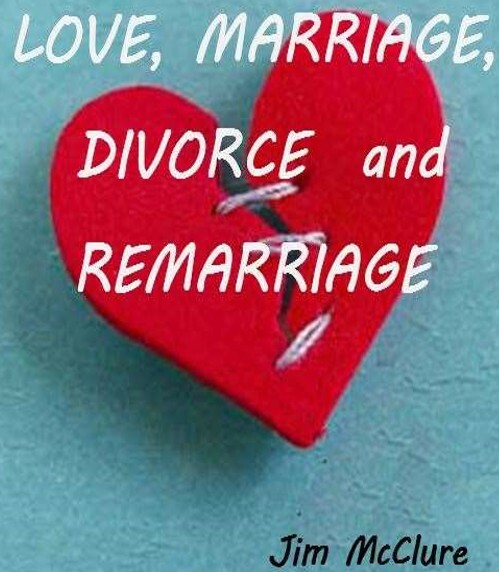 Love, Marriage, Divorce and Remarriage will be available in an electronic version in EPUB, Kindle and PDF formats with hyperlinks (as is Dr Jim’s well-researched Grace Revisited) and is offered free. ← WHO WANTS TO BE ‘JOSEPH’? Pingback: TIS THE SEASON TO BE JOLLY – OR IS IT? | Connecting with You!